These floors add a touch of class to any event and suit black tie events perfectly. No Function is complete without a floor. They are perfect for all events. Our floors are suitable for indoor and outdoor events and come with shiny aluminium safety edging. 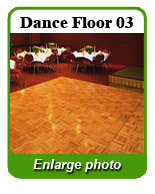 Our floors are available in different styles and sizes to suit all events. We will come and install the floor before your event begins and pick it up either at the end of the function or the next day. We also can offer long term hire for events such as Christmas or Summer parties. 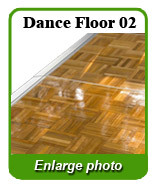 Our dance floors feature an oak parquet pattern with silver edging. As a general rule of thumb for each person you invite to a party you should have 3ft x 3ft of floor. 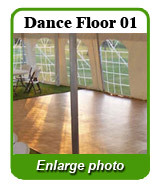 For example an event for 100 people a dance floor of at least 200 ft sq should be hired. Rental rate starting at $390 per day. Rental rate starting at $230 per day. Rental rate starting at $430 per day. Rental rate starting at $350 per day. Rental rate starting at $300 per day. Rental rate starting at $250 per day. Rental rate starting at $155 per day. Rental rate starting at $190 per day. Rental rate starting at $13 per day.